The Market Place, is a monthly event, providing fresh food, financial advice and other services for a small town in the Adelaide Hills. There’s an old saying, “You cannot warm the hearts of people with God’s love if they have an empty stomach and cold feet”. At Mount Barker Corps in South Australia, they take this saying literally with their monthly market. 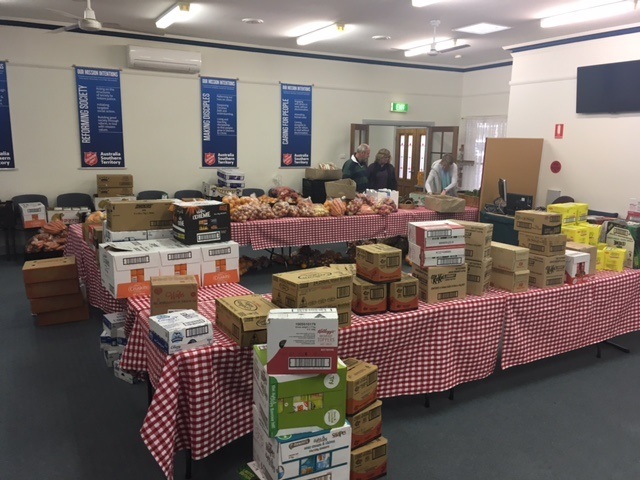 Partnering with the Mount Barker Council, and The Salvation Army’s Doorways and Moneycare services, the small corps in the Adelaide Hills runs a monthly event called The Market Place, providing fresh food, financial advice and other services for the town of 16,000. Sharon Maslen, an adherent of Mount Barker Corps, started the market after seeing how successful Adelaide City Salvos’ monthly market had been in assisting the community. “This market really is about the priesthood of believers. We can’t do it all ourselves, so Sharon got that up and running and raised up a team around her,” says Lieutenant Sarah Innes, the Mount Barker Corps Officer. In a community that sees its share of issues such as domestic violence, drug abuse, rising rates of homelessness, relationship breakdowns and mental health issues, The Market Place gives people a safe place to find friends, food and a message of hope. “We already run emergency relief and financial counselling from this venue, so it’s also about offering the opportunity to connect more and come along to this free market,” says Lieut Innes. For a corps that already provides invaluable services to the community, serving fresh food seems like a natural progression. But it isn’t without the hard work of corps members and volunteers who are willing to make a difference. They are supported with food donations from Food Bank and Secondbite, and have partnered with the Mount Barker Council to provide flu shots. Each month, this sees between 70 to 140 people come through their doors for a hearty meal, and everyone is welcome. Donated produce ready to be sorted. “We’re very intentional about having volunteers from the congregation here who can come alongside people and just chat and build relationship. We see it as a very holistic ministry. It’s about providing food, but it’s also about being willing to be like Jesus,”says Lieut Innes. “We have tables and tables of food, and we are cramming other tables with people. We can’t fit everyone in ­–some even eat standing up!” she laughs. Community is of the utmost importance, according to Sharon. “One of the apparent successes of The Market Place is the sense of it ‘building community’that it has achieved,”explains Sharon. A cooking demonstration is given to guests using the fresh produce they are provided with, as well as a presentation by a community service. From here, they are invited to connect with the corps, and prayer is always available. Yet among this organised chaos, the mission of the Salvos remains the forefront of the corps’work. And they are determined to use the space to live, love and fight alongside their community and start the day with shared scripture and prayer. “We’re going back to the very basics of our Salvation Army heritage, which is you can’t minister to someone who is hungry,” says Lieut Innes.